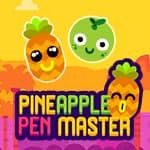 A comic mobile game, performed on a previously popular music video Pineapple feather. The player must throw darts into a variety of fruits, avoiding misses. There are 3 game modes, which will be to the liking of any player.